The Decimator II G String has 4 ¼ inch jacks. Connect the guitar directly to the Guitar IN. Connect the Guitar OUT to the input of the amplifier. Connect the DEC IN to the loop send and DEC OUT to the loop return. 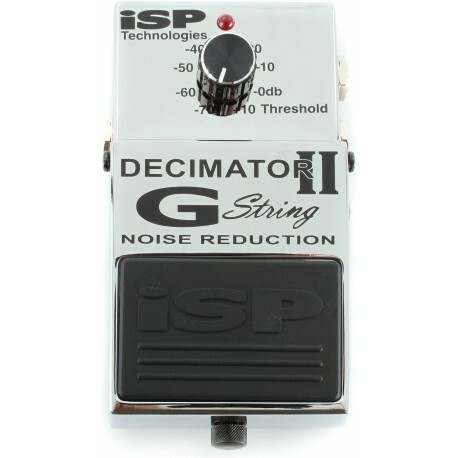 The Decimator™ II G String Noise Reduction pedal is the latest generation in noise reduction technology. The Decimator features improved Linear Time Vector Processing that offers the smoothest, ripple free approach in tracking the envelope of the input signal. The LTVP will instantly respond to short staccato notes and at the same time provide ripple free control of long sustained notes while downward expanding. The Decimator II G String Noise Reduction pedal is easy to use and simple to operate.